Can I get a hip-hip-hurray for a three day weekend?!? Hi, I’m Jessica and I blog at Mom 4 Real. 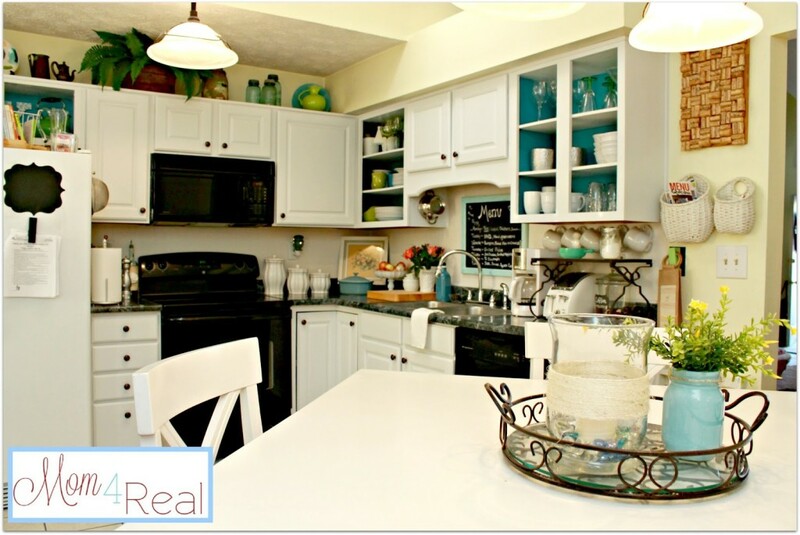 My blog is all about keeping it real, and living well on a budget. I have two kids, a husband, a dog, and a cat, and we all live happily in a smallish house in Kentucky. I love to make inexpensive and unique changes as often as possible! So, let me show you around. 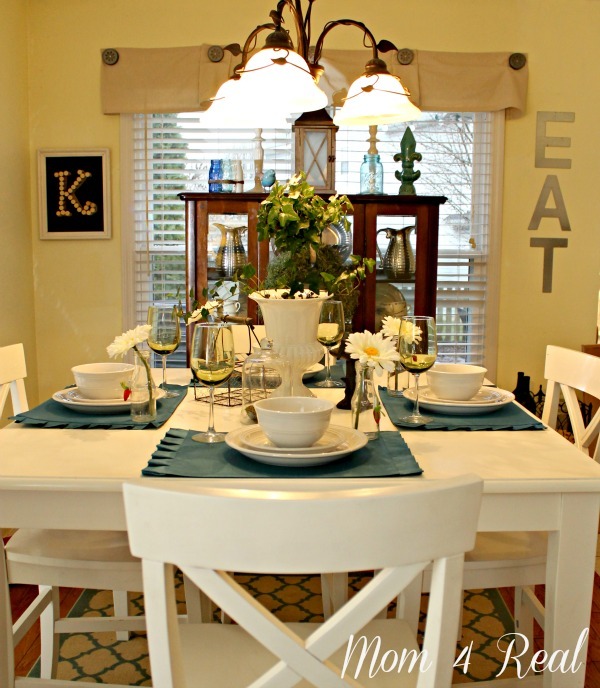 When you walk into our home, you are greeted by my favorite colors…blue and white. We had the standard green front door and parquet floors that were in desperate need of some help, so I painted them to add a fun touch when you walk in! 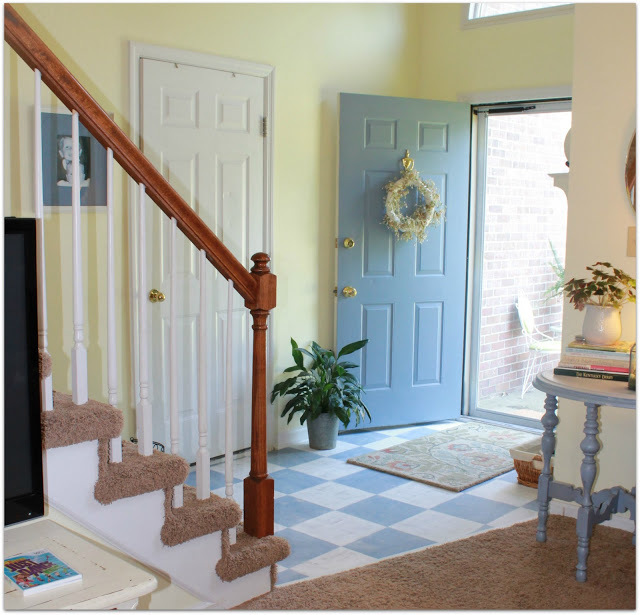 Our foyer is quite small and leads upstairs or directly into our living room. 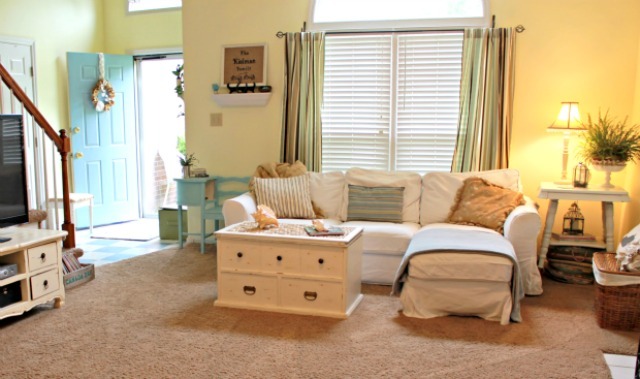 Our home is all about being comfortable…I want my kids to crash on the couch after a long day at school and put their feet up, so slipcovers are a must…plus, I mentioned the dog, right? 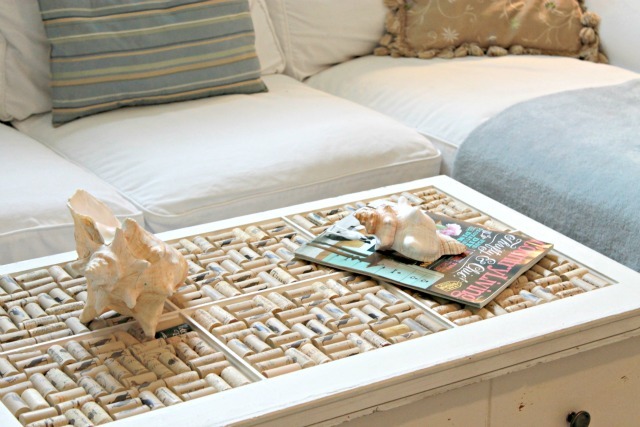 I recently made this cork topped coffee table…well, I didn’t make it, but I did give it the new top. We definitely like to keep it unique and interesting around here. 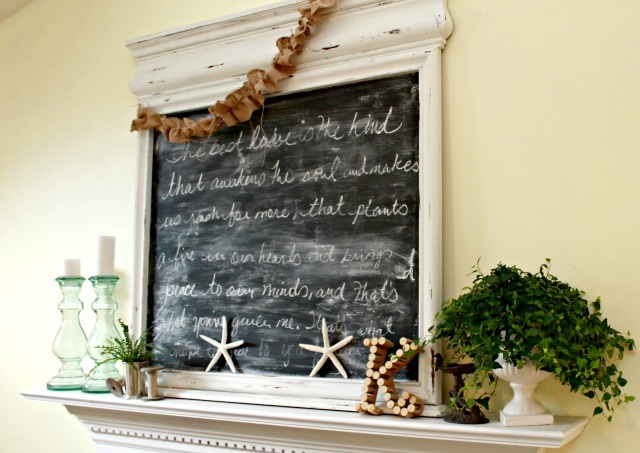 I adore decorating our mantel when the seasons change…right now, there is this huge chalkboard that used to be a mirror with some shells, a wine cork monogram, and a couple of plants. You could come back tomorrow, and it may be totally different! Our living room leads opens up to our dining area. I used a mix of aqua and white to keep the flow of the living room going. I told you things change here often…not sure if you noticed that the table is completely different here, and you get a little peak into our kitchen. 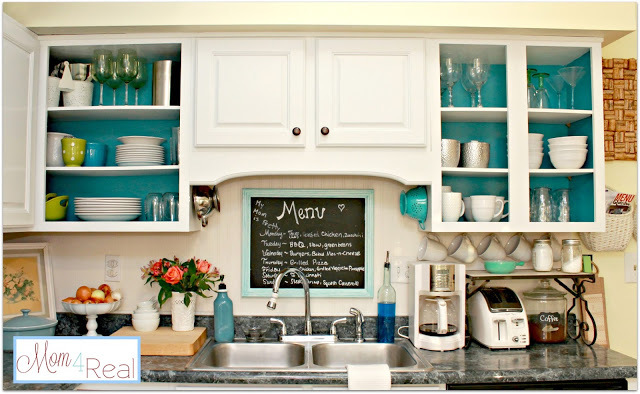 I recently painted our kitchen cabinets white, and ended up taking some of the cabinet doors off and painting the insides a gorgeous deep aqua. I added beadboard backsplash and a fun little chalkboard menu. Our kitchen connects to a teeny, tiny breakfast nook that shares the same theme. This is my favorite spot in our house! 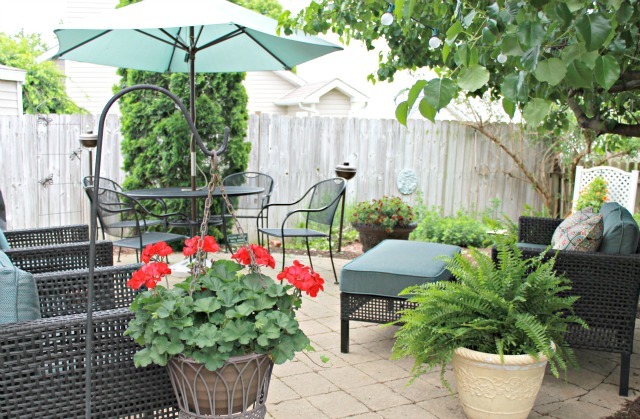 Right outside our breakfast nook door is our patio…it is small as well, but perfectly intimate. We spend all the time we can out here as a family. I wish I could show you all of my flowers, but they are not blooming quite yet! I’ll conclude this little “snoop session” with a little peak inside my daughter’s new bedroom. She caught the aqua bug as well, and I couldn’t be happier! Thank you so much for hanging with me! I’d love for you to come visit my blog, Mom 4 Real! Thank you, Jessica. I loved snooping around your lovely home. It is so warm and inviting I just wanted to jump into the photos and live there! Let’s connect! You can find me here…. 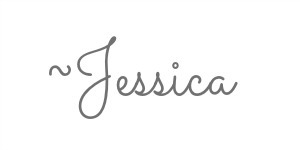 Thanks for sharing Jessica’s home and introducing me to her blog! What a great feature to me to explore this weekend! What a great home! Love the chalkboard on the mantle and that table with the corks. Thanks for letting us snoop! Have a great weekend! What a great looking home. I could move right in! Oh you know I LOVE all that aqua. 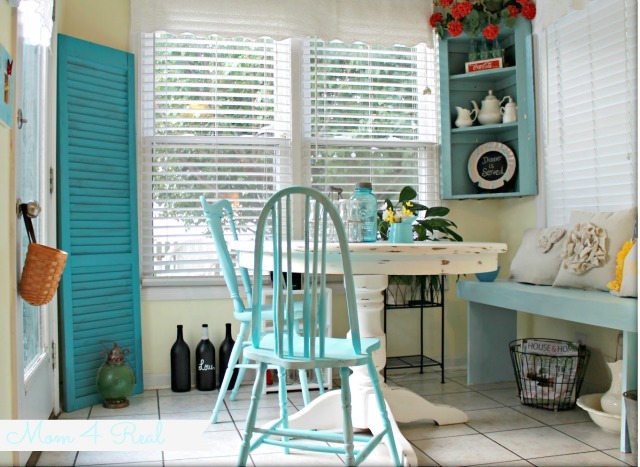 I think my favorite space is the breakfast nook as well!